An inspirational film focusing on the Transition movement. Sixteen stories from 7 countries around the world of people doing such things as printing their own community money, growing their food in unexpected places, localizing their economies and setting up their own community power stations. In a world of increasing uncertainty, here is a story of hope and ingenuity. The screening will be followed by a discussion featuring two Sooke Transition Town members: Erik Bjornson of Natural Landscape Solutions and Mary Coll, a local farmer who studied permaculture in Ireland with Transition Movement founder Rob Hopkins. 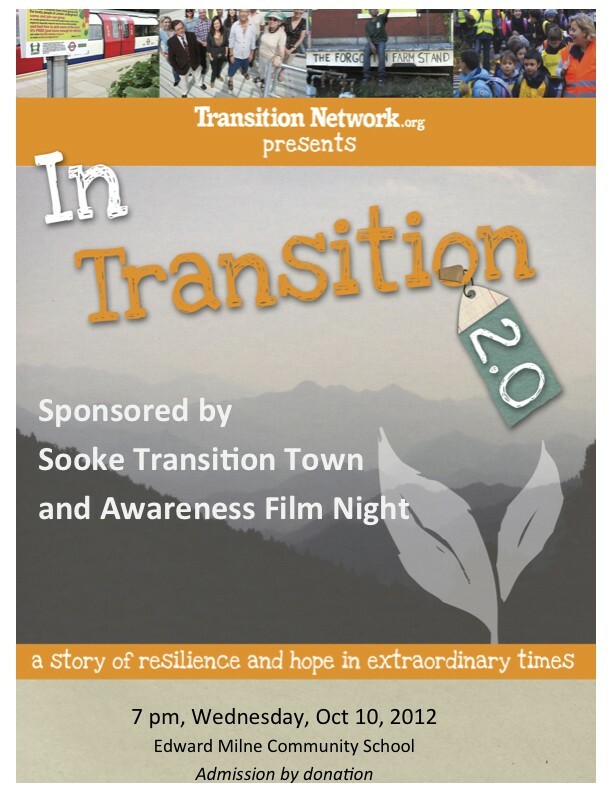 The discussion will be facilitated by Sooke Transition Town Society’s Margaret Critchlow. The focus will be on what projects filmgoers would like to see the local Transition group tackle in the Sooke area, such as a local Time Bank and/or organizing street or “pod”-based initiatives in the community where neighbors gather together to work on concerns or plans for the streets or areas where they live or work. Come and bring your own hopes and ingenuity.